Grazing animals need to be managed in order to accommodate desired results in terms of animal, plant, land and economic responses. Grazing Management, Second Edition integrates principles and management techniques that apply to all grazing lands and to all grazing animals. 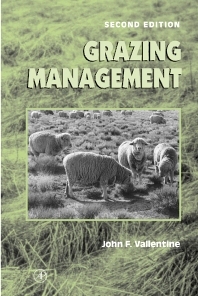 This comprehensive volume provides authoritative review on a wide range of relevant topics: animal nutrition and nutritional balance when fed on different sorts of grazing lands; seasonal variation and limits placed on ecosystems by grazing; the effects of grazing on grazing lands; the various sorts of grazing behaviors; selecting plants and managing grazing lands, as well as many other important topics bearing upon the methods, practises and procedures for properly managing grazing lands and animals. Faculty, researchers, graduate students, land managers, and extension services personnel responsible for grazing and rangeland management for both wild and domestic animals. Federal, state, and local departments of agriculture. Libraries at institutions with strong animal science, animal nutrition, land management, and land grant backgrounds. Grazing Management is recommended as both a textbook and as a reference manual. As a textbook, the prime audience is 4th & 5th year university students with a major in range science, animal science, big game management, or agronomy. As a reference manual, it will be utilized by extension and research personel, grazing land managers, innovative ranchers and farmers, agribusiness personnel and conservationists. The Role of Grazing Management. Grazing as an Ecosystem Component. Grazing and Land Use Planning. Nutrient Levels in Forages and Ingesta. Determinants of the Grazing Season. Balancing Seasonal Supply and Demand. Daily Activities: Time of Day. Memory, Past Experience, and Training. Forage Factors in Site Selection. Slope and Related Physical Factors. Patch Grazing: Problem or Benefit. Animal Equivalence and the Animal Unit Month. Grazing Intensity Effects on Vegetation and Site. Grazing Intensity Effects on Animals and Economics. Introduction to Special Grazing Techniques. Role of Special Grazing Techniques. High-Intensity/Low Frequency (HILF) Grazing Systems. Grazing System Effects on Game Animals. Manipulative Benefits of Animal Grazing. Biological Plant Control by Grazing. Manipulating Animal Habitat by Grazing. Grazing to Aid Forage Plant Seeding. Brigham Young University, Provo, Utah, U.S.A.